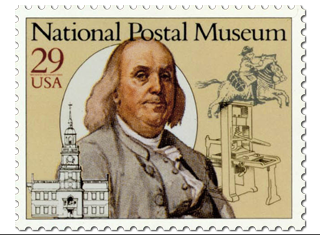 In Philadelphia, on July 26, 1775, Benjamin Franklin was named the first Postmaster General of the newly established United States Post Office. He still held that office the following summer when the Declaration of Independence was drafted and signed, and, so, remained the Postmaster General of the United States Post Office (USPO) until Nov, 1776. Then in 1792, as a result of the Postal Clause, the United States Post Office became the United States Post Office Department (USPOD) and congress was given the power to create post roads and post offices.